Then and now tree planting. 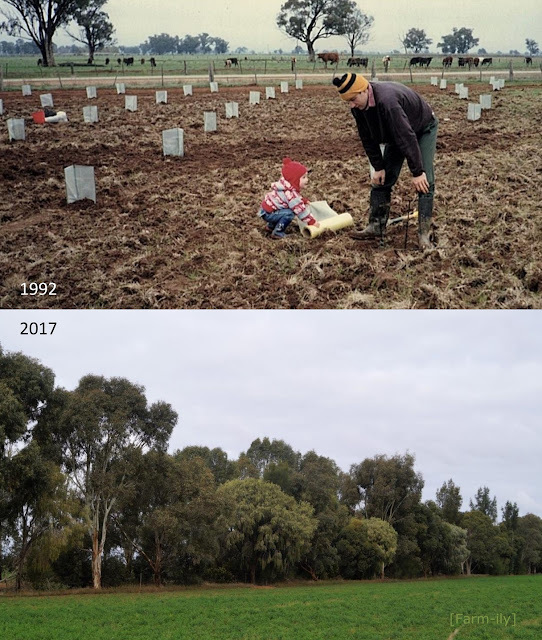 Over years we have planted thousands of native trees on our farm and have been involved with the local Landcare movement right from the start. There are many benefits to doing revegetation works like beautification, shade, shelter, carbon sequestration, lowering the water table & salinity control to name a few but the one I am most thrilled about on a day-to-day basis is the habitat that we have created and the increase in our biodiversity, including birdlife. We now have an incredible list of birds that frequent our area, and that I am most proud of. While you weren't cutting edge, you were certainly there in early days, and I congratulate you. You have put your money where your mouth is. Many more people have to try to put up some native habitat. And there is much to be proud of! I love it when farms leave tree rows...and love that you have been planting some since you started farming. That is an astonishing and very positive step to have taken and achieved. Amazing how much the landscape has changed You have got shadows and birds their home. So very much to be proud of too!